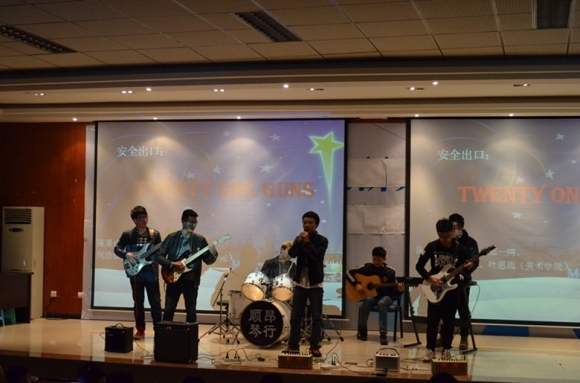 The First Auchin Cup English Drama Performance was held at 6:00pm on the 27th of December in psychology college of SWU. The main participants were freshmen from software engineering and automation. The evening party is mainly based on English drama, and partially based on song, dance and short act. Moreover, games were included too. The drama performance invited English teachers from AEMG as judge, who were also responsible for prize presentation. There were 5 awards together, Prize for the Outstanding Talent, Prize for the Best Organization, Prize for the Best Creation, Prize for the Best Planner and Prize for the Best Drama Group. During the performance, the students showed their prepared drama on the stage confidently. Song and dance performances were brilliant too. The audiences took part in the joint game enthusiastically which created a remarkable degree of excitement. The drama show proceed in cheers and laughter. The students showed their talents and class style were showed up by means of this way. At the same time, friendship has been enhanced, students from different major knew each other well in this way, which strengthen the cohesion in the Joint Education Program. Moreover, it improved student’s cultural realization according to the drama performance, which also made them interested in English learning.